We started off by developing an efficient and compact speaker system in 2004 powered by a small leisure battery. 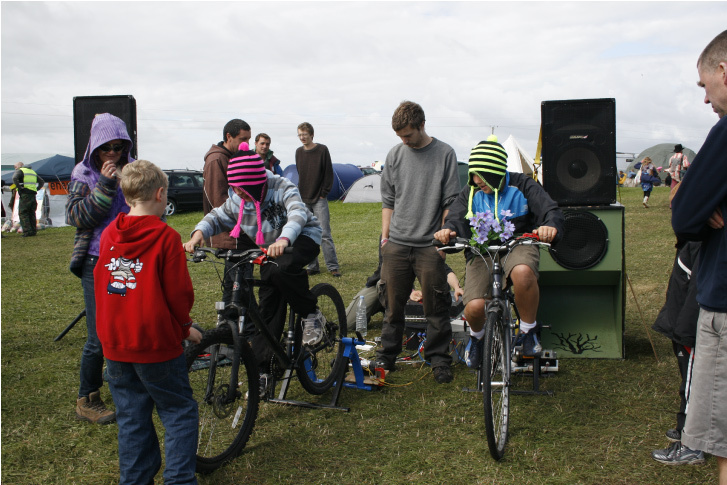 The research and development was supported by our close ties with the High Pressure sound system and Purple PA.
Our use of bike generators started in 2009 when we put together a small system which was a great success. Prompting BBC reporter Joel James to list it as one of the highlights of a local festival. We toured a few festivals and had a really good time. So in the winter of 2009 after receiving a bit of funding from ‘UnLtd’ and a tax rebate we embarked on a mammoth system upgrade! We now have 6 bike generators which are rated at up to 300watts each using a special drive system which is more efficient than conventional tyre on roller designs. Our amplifiers use modern digital switching technologies which allow a smaller package and produce less heat. We save weight in the van, (again less fuel) they achieve a much higher efficiency than standard technologies and have a very low harmonic distortion. We use custom built, compact, and extremely sensitive, line array speakers which project (or throw) sound a long way. This is what allows us to cover really large audiences (up to 2000) or massive 60meter long tents like The Acoustic Festival of Britain. 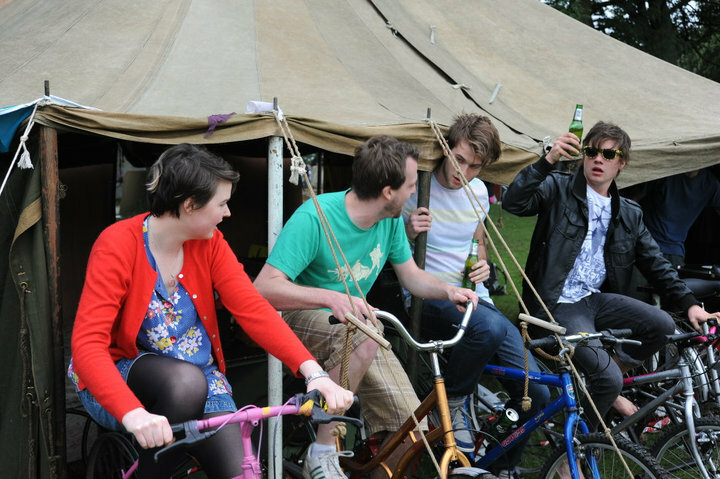 Because every link in the chain is designed with maximum efficiency in mind we can really impress the cyclists with how much crisp clear sound pedalling can generate. Which makes it even more impressive for the cyclists and audience. Unlike Solar/Wind powered systems we generate and use the power as we go so we don’t need a huge truck full of batteries. This further helps us lessen our environmental impact. There also are obvious health benefits for the adults and the kids really love pedalling. Every time we do a gig we get loads of compliments on the quality and level of the sound. This is further aided by our band engineers who really get the most out of the performance. Check out our list of services, or what people have to say about them.